Hi, fellow TFL members, old and new! I've been meaning to write about my career change, and where it has lead me, but I have been too occupied with settling my family and was lazy to post anything. Following the brief apprenticeship at a local pastry shop in Beirut, I travelled to Seychelles for a job opportunity at a French Bakery there; or so I thought. 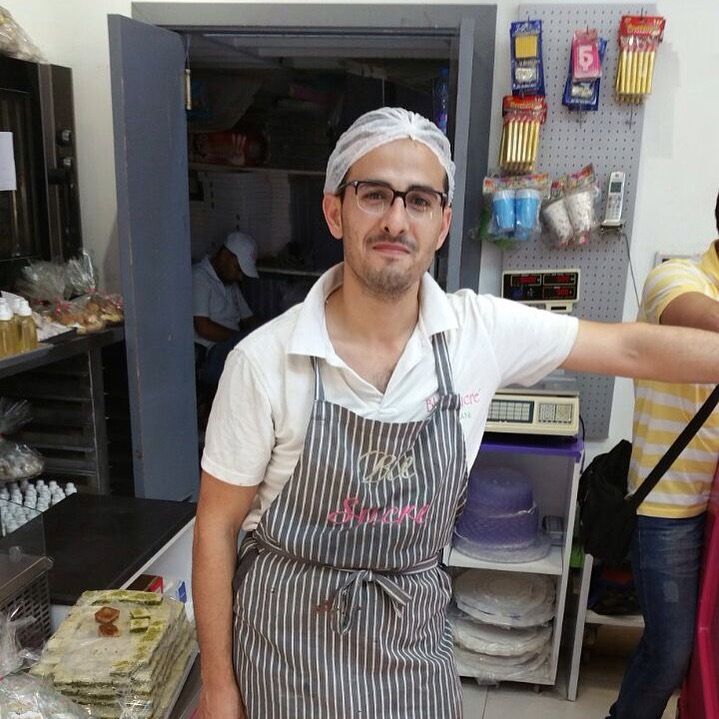 I worked for a total of 1 month at the Bakery, learning valuable tips and tricks from the Bakers there. However, at the end of the month, the owner of the Bakery had suggested that I travel back to Lebanon to work at his flour mill up in the north, on the outskirts of Tripoli- Lebanon. I now work at the mill, in a Bakery attached to their Lab. I like their bakery; it is both spacious, and well equipped. Basically, my job is to test their flours for quality, and consistence, and do controlled bakes to compare their flours to those of their local competitors. I'm also involved in testing new products and help improve current ones. In case you were wondering, I have not abolished my plans to start an Artisan Bakery. I just need to gain more knowledge, more experience and broaden my horizons. In the meanwhile, I'm testing the market here by baking artisanal breads everyday, especially sourdough and giving them away to friends, and family. At first, not many have appreciated the subtle sourness of naturally leavened breads, but slowly they are developing a taste for it. Lebanese, in general, have been raised on Industrial, mass produced flat bread, or khobez. Their everyday "French bread" is the "Sammoun" or mini baguette; an improver, sugar laden white fluff (or brown for that matter) with a crust. You get the picture. 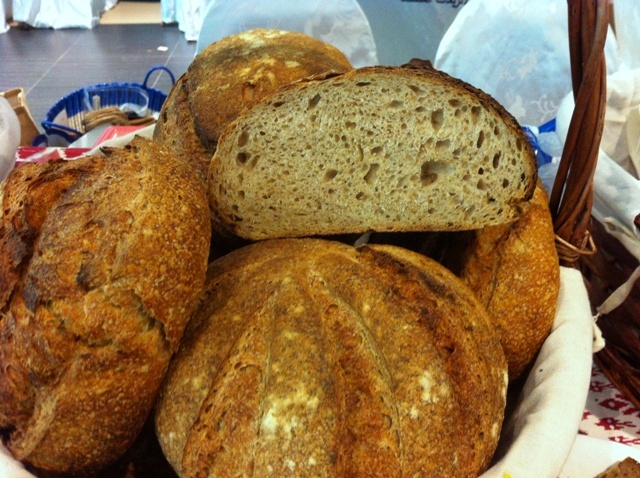 i know I'm not the only one who is trying to change all that, there are a couple of Artisan sourdough bakeries/ cafe's in Beirut and other cities who are doing a wonderful job at bringing back nutritious, flavor packed bread to the table. I plan to visit those bakeries soon, talk to their owners, and try to get to know them upclose. I don't know what life has in Store for me tomorrow, but I'll do my best to be prepared for it. Read more about I'm a baker! I've been yearning for some real Artisan bread, but fate seems to have it some other way. Sadly, plans to start a Bakery have taken a detour, as things did not work out. Among other reasons, lack of sufficient funds and professional experience, have taken a toll at last. It was time to move back with the family to my Native Lebanon. As Artisan bakeries rarely exist here, i did an apprenticeship in a local Patisserie shop in Beirut For about a month (not sure if that counts as an apprenticeship..) and although i've completed a pastry program 4 years ago, It was my first exposure to a bakery kitchen. Despite my brief training, I learned quite a bit about Pastry production lines, and had some hand's on experience. I learned new lessons, and grew out of this experience, and now that i Reflect back at this past year, i have no idea how i made it through a career change! it was quite a ride.. But... I did make it , and i'm glad to be whole again. News: I'm set for another opportunity. Something looms from afar.... Something off-shore. More on this in another post. Hi fellow TFL mates, and a belated Happy holidays to you all. There is progess.. slow, but sure. The Bakery name has been decided. A Location has been found. Although FAR from the city center, and cast away inside a Mall at a residential community (the only decent space we could afford for now....), the location shows promise. The surrounding residential community is growing, and families / households who love and know good bread actually do exist in the not-so-far vicinity! We face numerous obstacles as i write this. After many attempts to raise the Power connection to a decent level fit for a Bakery, we've reluctantly settled on a 45 KW power load (An ordinary 3 deck electric oven feeds on a 30 Kilowatts all on its own!) Gas is out of question (technically) for now, and an auxiliary power unit (generator/inverter) fitted outside/on the roof is not permitted.... which leaves us with 15 KW to run the whole show! Furthermore, negotiations with many Investors are still in the works, as we try to convince their royalties that the concept is worthy of their hard earned money, all while baking sourdough for them to try and sell them on the idea. Wishing you all the best. Bake on people. Believe. I’ll leave you with some of my recent bakes. It has been one heck of a ride, since June of this year. I have finally taken the leap... I quit my job in June 2015, in search of a Bakery related job. A 14 year desk job, and a dwindling Money exchange establishment has left me in despair for years. I have always sought solitude in baking bread, perhaps in an effort to relieve myself of the stress of a corporate desk job that has given me nothing but disappointment during the last couple of years. So, it has come to pass that i'm now finally free. Free of the rut, that i admittedly was partly responsible for. Free of a career that has lead me to a dead end (i didn't particularly like it, in the first place!) The journey to realizing my dream of owning an Artisan bakery has not been a smooth sail. Not by a long shot. The worry and anguish still grips me from time to time. But, i'm slowly but steadily outgrowing my fears. one loaf at a time. Currently, i'm working for a friend that owns a Crepe shop. He is quite a passionate home baker, and seeks to turn his creperie into a sourdough Bakery. We are working together to get this project off the ground, so stay tuned for more news. Till then, i continue to bake for the Arts and Crafts Market, and for another new Market in a Mall at a residential community in Dubai. The bread has a steady following now, and the bread sells like hot cake .. in most cases. My production has increased to about 50 loaves for the Markets. I'm quite happy that i was able to produce this quantity from my small kitchen. I will keep everyone posted of further developments of the Bakery project. 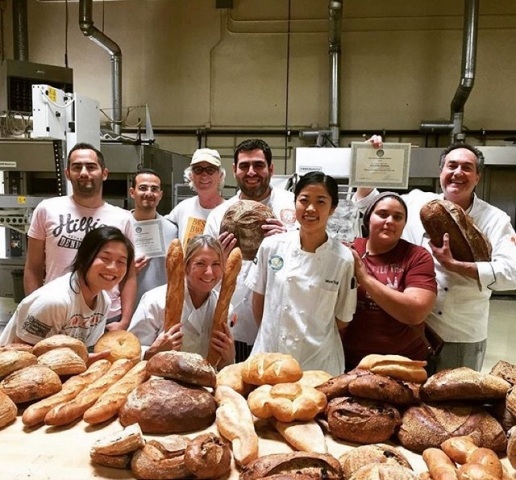 Earlier this month, I have taken artisan II sourdough classes at the San Francisco Baking Institute. Upon my arrival, I contacted David Snyder (dmsnyder) who offered to pick me and my friend from the Hotel next morning. As blogged by David, we parked in the city, and walked up to the ferry building , where the Saturday’s Farmer’s Market was located, and there, we met David’s brother Glenn, (also a TFL member). After visiting the Market and notably Acme, and Della Fattoria Bakeries and having some of their pastries, Glenn took us to a high rise building where he works and the view of San Francisco Bay from his office was spectacular. We went down and walked across the block down to Tadich Grill. We had some fine grilled fish there, and the place was charmingly classic and vintage. Loved the food and the sourdough on the table.We then headed back to pick up some tickets for the muni (Bus) in order to get to mission district, where Tartine and thorough bread bakeries are. We had some fine pastries and coffee, at Tartine. I bought a Danish Rubrod , since their fresh bake for the day has not yet come out of the oven. I took some photos when they were loading the country white. It was probably around 3:30 in the afternoon by then. We moved to Thorough Bakery, which is owned by the San Francisco Baking institute, but were not able to consume any more pastry or coffee .In retrospect, I regret not sampling their wares, as i found later how good SFBI’s pastries are. Later, we took the muni Back to where the car was Parked and we drove to meet Glenn at B. Patisserie; another Bakery Co-owned by Michael Suas of SFBI. Needless to say, that everything was spectacular. I bought a baguette, and had a Kouign Amann Pastry. Exhausted from the 16 hour flight, and overfed with Pastry and coffee, we asked David and his wife Susan to drive is back to the hotel. David, his wife Susan , and his brother Glenn were such kind, and hospitable people. I thank them so much for that super fun day. The following day, my friend and I took the Bart to the city, where we visited The Mill. We had a late breakfast of almond butter on Whole Wheat toast , and a coffee. We lined up for a bread, too, and picked up an Einkorn loaf. The Toast was very good, and so was the bread. We walked back to the nearest BART station and headed back to the Hotel in order to take rest for next day’s class. Next morning at 7 am, we headed for the Institute. Our Instructor was Chef Miyuki, who began the day with a lecture summarizing the main points covered in Artisan I class, and introducing Sourdough Baking. After having acquainted with the rest of the students, we were divided into 3 groups, each stationed at a table. 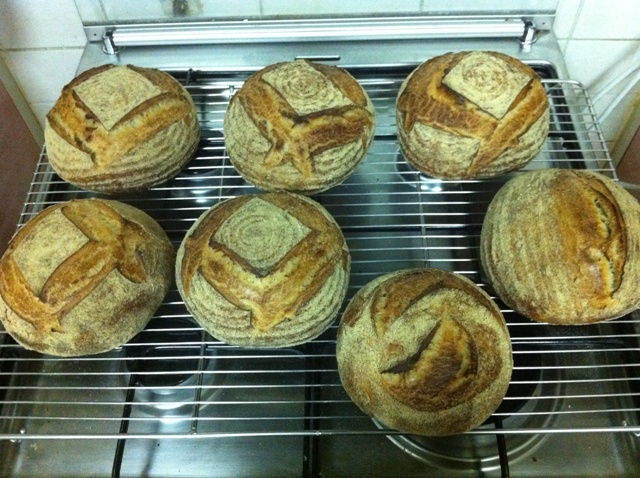 On the first day, we had a yeasted levain White bread to mix, proof and bake on the same day. Furthermore, we had to start a new sourdough culture which we are supposed to bake with on the 5th day. Also, we fed multiple levains for Day 2 doughs, and scaled their final dough ingredients. On Day two, we mixed final doughs for 4 breads: a single fed stiff levain, a double fed liquid levain, a double fed 70% stiff levain, and a double fed 40% stiff levain. By the end of the class, the breads were baked, and some were cold retarded to be baked first thing on Day 3. We had a tasting session, where all breads are sliced and sampled. The single feed stiff was the most sour of all 4, followed by the 70% and the 40%. As expected, the liquid levain bread was mild with a slight hint of sour. Before we left for the day, we mixed levains for next day’s breads, and scaled their final ingredients. We were scheduled to bake different breads for Day 3: a Whole Wheat sourdough, a sour Rye, a multigrain, and a semolina bread. Day 3 began by mixing the scaled dough ingredients for all recipes, one at a time. We then baked the retarded loaves from day 2, which were cooled and stacked away for later sampling, We witnessed firsthand the effectiveness and efficiency of a spiral mixer. We learned when to stop mixing, and how to test the dough for strength. Miyuki demonstrated the stretch and fold in the bucket, in addition to scaling, pr-eshaping, shaping, scoring and baking. It was such a delight to see her skillfully and swiftly manipulate a piece of dough into a seamless elegant shape. We baked all loaves, and prepared the leavens and scaled final dough flours for next day’s breads. After having our breakfast on day 4, we proceeded to mix the final doughs of all 4 breads. The breads were: Walnut- raisin, Olive , Ciabatta, and Challah. A Hand mix dough was also mixed to be baked next day retarded as a Miche. Same goes for Day 4; proofing, scaling, shaping, and baking. However, we retarded the Olive and Walnut raisin to be baked on Day 5. I was finally confident of braiding a challah dough, after Miyuki’s demonstration. At the end of the day, we mixed leavens for Day 5, and scaled the final ingredients. Day 5, has arrived. I noticed no loss of energy or enthusiasm amongst my fellow students. We were all working with dough as if it were day 1. We began by mixing 2 doughs: a A levain Baguette with a Biga, and a stiffer French dough for decorative shapes. Cold fermented Olive and Walnut raisin were then baked, and then set aside to cool, followed by the 1.5 Kg Miche. Miyuki showed us how to stencil images/letters onto a Miche. We scaled and proofed the baguettes on linen, and then shaped the French dough into decorative pieces, such as a fendu, a tordu..etc. It is noteworthy to mention, that most of the breads that we baked in class had a small quantity of instant yeast added. As the last of the baguettes came out of the oven, we headed to class for a recap Lecture. At the end of the lecture, Michael Suas, the man behind it all, walked in. He congratulated us, and after a brief chat with the students, he distributed the certificates. Before departing, we gathered downstairs for a group photo, and bid the faculty and each other farewell. As a finale, i visited the Fisherman's Wharf, where Boudin Bakery is. I took a couple of pictures, and bought a chocolate filled sourdough. It was such a monumental Bakery to be in. and so ends my trip.The charming experience of these 5 days will remain etched in my memory for years to come. Been quite busy for the last months, but I have some news for you all. First, I would like to share some pictures of my latest participation in ARTE (Arts and crafts market, or Artisans of the emirates). Things have been evolving gradually for me, and I have become more confident with higher production volume; I’m now capable of baking 12 loaves at a time in my new oven : Giorik – Magnifico, a countertop convection oven with humidifier, pretty much similar to Varda and Janet’s Cadco. The oven bakes well, and I’m beginning to learn ways to generate enough steam while keeping the heat in. I’ve baked three loaves for the last market: A rye sourdough with sprouted rye, flax, sunflower, and pumpkin seeds; a Whole Wheat levain, and a Vermont sourdough with whole wheat. 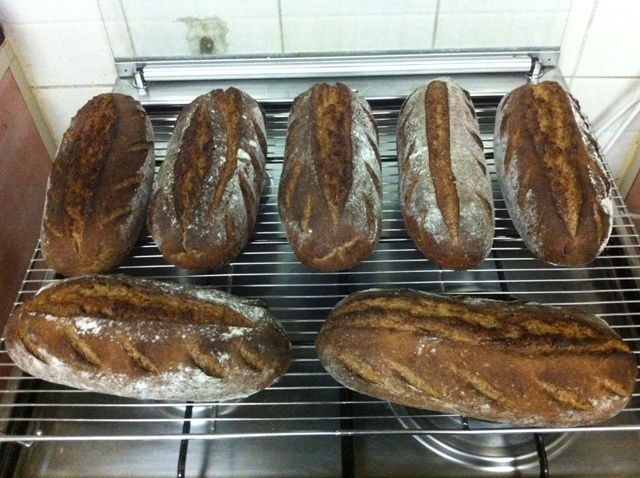 The Rye was baked in pans, while the oven was shut off for the first 15 minutes (steam towels in). The Whole wheat levain, and the Vermont were baked free form on trays. The difference between the whole wheat levain and the Vermont was in the duration of bake with the oven off. The whole wheat levain were baked in a preheated oven that was switched off during the first 15 minutes (all with steam towels in), while the Vermont was baked in a preheated oven that was switched off for only 10 minutes. The result was quite obviously in favor of the latter: the 10 minutes off. The oven spring was improved and cuts opened evenly, and resulted in a better crust overall. I don’t claim that this is a conclusive controlled test, as the whole wheat levain was slightly under proofed, and thus exploded somewhat in the oven; and thus the crust was hard and thick. The Vermont sourdough was retarded (shaped ) and baked after two hours of countertop warm up time. 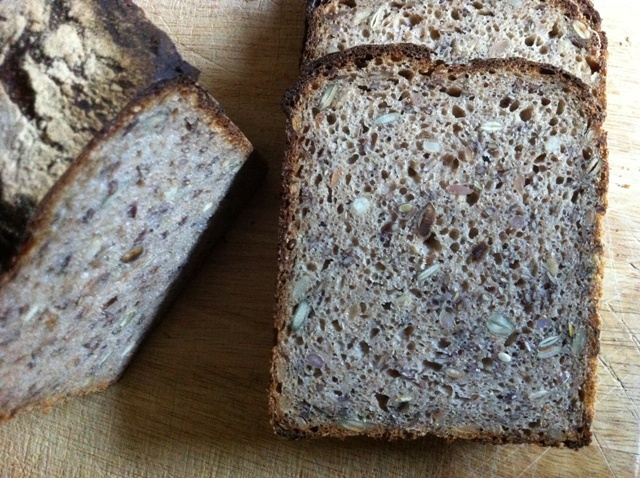 The sprouted Rye sourdough, my new recipe, is loosely adapted from Hamleman’s 80% Rye with rye flour soaker. It was sliced on the Market day, scaled to 600 gr loaves , then wrapped in paper bag and tied with a craft twine. In hind sight, I should have left a whole unsliced loaf for display. The rye was also a success . The slowest selling bread was the whole wheat levain. The crust was thick, and the flavor was slightly sour, which did not appeal to some clients. One client thought that the dough was flavored with lemon juice! The day at the Market was crawling in terms of visitors’ flow. The sale peaked at noon, as soon as the market started at 12:00 pm. 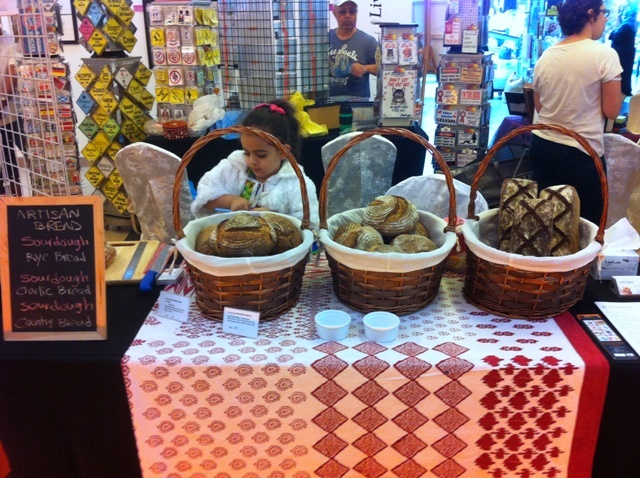 Not surprisingly, the Vermont sourdough was a instant hit, and sold out within an hour. I’ve only baked eight loaves of the Vermont, due to my limited refrigerator capacity, but I’m planning to purchase another tub to retard my dough in bulk. Furthermore, the Vermont sourdough , or “Country White”, was baked early in the morning of the Market day, and was fresh. Yet, I’m still the only, lonely, bread baker in the Market. I’m puzzled by the lack of awareness for Artisanal breads, especially for Sourdough; quite few of the customers appreciate the flavor. About a month ago, I had been to Kuwait on a personal trip and visited a sourdough baker at her stall in a local Market called: The secret garden project. It is such a nice community Market, lead by organic farming enthusiasts and foodies. The lady’s alias on Instagram is : Auntmarie’s bakery, and she makes Delicious , and attractive sourdoughs. 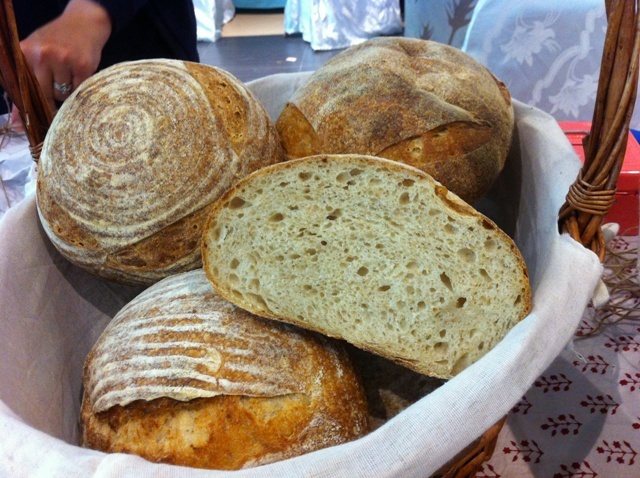 Other vendors at the event make sourdough bread as well and sell Tartines , and it seems as though Artisan bread culture has quite caught up with the local foodie scene in Kuwait. What struck me even more is that The lady sold out her entire thirty loaves, mostly sourdoughs, in an hour! The price tag for a 1 Kg Miche was not cheap, but the bread was spectacular ( I have purchased two loaves myself ). I wondered why this was not the case back in Dubai, even though it is touted for being a sophisticated multicultural destination in the middle east. On another cheerful note, I’ve signed up for Artisan II bread classes in June 15th at SFBI ! I feel I need the hands on experience and the professional training, now that I’m beginning to switch into a new career in baking. The reviews on the courses from renown TFL members like Dmsnyder and several others on, in addition to the recommendations by the auntmarie’s, (who has attended both Artisan I, and II), were more than convincing. Best wishes to all, and Happy baking! 1 – I attended January’s Arts and crafts market. It was fun , but I only sold around 80 percent of my bread (18 total loaves). 2 – I bought a gas convection oven (7 racks), but could not work around connecting it in my rented apartment. (too many restrictions by the building and the gas company). Electrical version was out of question as it needs 90% of my apartment's total wattage. So, I’ve returned the large oven, and had it replaced by a 4 rack electric oven (countertop size). The other oven is yet to arrive, so more on that later. 3 – I attended February’s Arts and crafts Market. The business was slow. I sold only 70% of my bread. The low traffic was, in part, due to my table’s location. But, all in all, it was a good, lively market that has been growing and hosting really skilled Artisans. The atmosphere, also, is very friendly and family oriented. 4 – As to my plans to start a Bakery, I have no time yet to commit to an apprenticeship; too much work /family obligations to look after. Will update everyone when it happens. In the meanwhile, I'm still searching for a local partner, and a suitable location for the bakery. 5 – I’ve changed my Instagram alias from Mebake to : goldenwheatbakeryae. 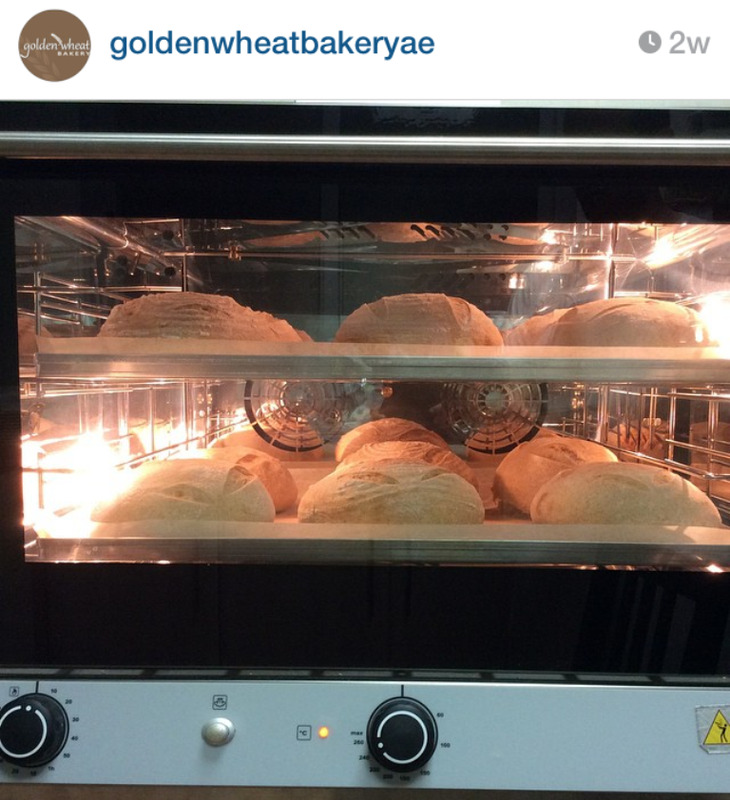 So, you may follow my progress on Instagram, and facebook: GoldenWheatbakeryDubai when I'm away from TFL. This is a 100% sourdough rye with rye flour soaker and toasted seeds (sunflower, and pumpkin). 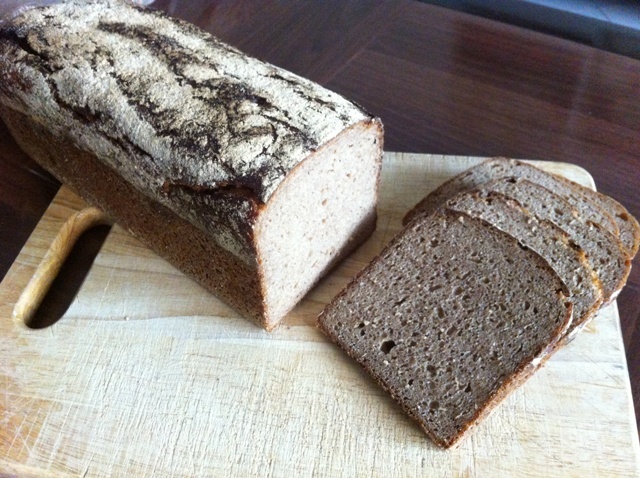 It is adapted from Hamelman's recipe : 80% sourdough rye with rye flour soaker in his book: BREAD, edition 1. Wishing everyone happy days, and happy baking. It has been quite a while, I know, but commitments and chores of life can have a toll on your time. If anyone is is interested in viewing my weekly and market bakes, here is my instagram id : http://instagram.com/MEBAKE _ (add an underscore after MEBAKE). I’ve been contacting two artisan bakeries, mostly franchises, for a chance of an apprenticeship and received mixed responses. One has refused and the other agreed, in principle, to train apprentices. I’ve yet to confirm whether this works for me, given the circumstances. They take in apprentices as full time job, and so I need to free myself of my current inescapable obligations. On the other hand, I continue to bake at home for the family and neighbors, in addition to the local crafts market. Two week ago, I baked for the November’s ARTE market. The market has evolved into a fully fledged artisan gathering, where numerous Artisans showcase their exquisite handmade crafts, in addition to home-made food. Anything from pastries ,preserves and condiments, to crackers and cookies were there, and were absolutely delightful to see, and eat. Here is a link to their website: www.ARTE.ae . For bread, I baked 3 types: A whole wheat multigrain with tangzhong (left), a 60% rye sourdough with wholewheat flour, sunflower seeds, old rye bread soaker (middle), and roasted garlic levain (right). 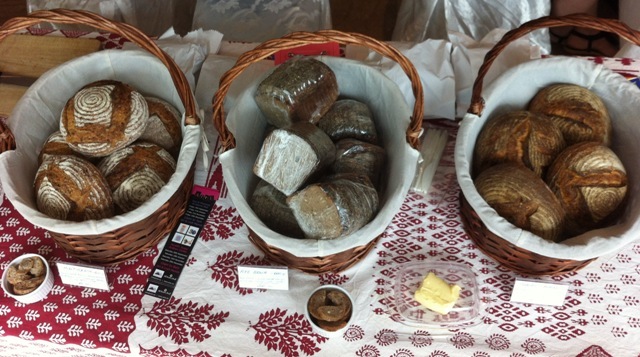 The market’s footfall was very good, and I received few compliments on the Rye bread from Austrian buyers. I sold out everything, and probably could have sold twice as much. My next plan is to purchase a bigger oven, to increase my baking capacity from 6 loaves a day to 18. I’ll blog about it when time permits. Happy holidays to all! and keep on baking! For October ARTE market, I baked 3 types of bread: Flaxseed Rye , Rye pain au levain, and the popular Roasted garlic bread. 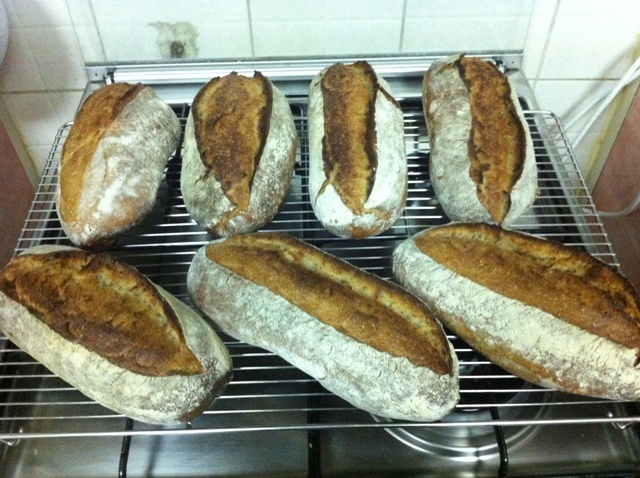 I baked a total of 20 loaves, 500 gr each 3 days prior to the Market day. The footfall at the mall was quite decent in October, but my table was cast to a far corner, so I did not sell out as fast. I had a French visitor who worked in an Artisan bakery in India, and was quite amazed at the fact that such bread could be baked in a home oven. I, of course, explained to her that it was possible with steam and stone, and owed my success to TFL. Another visitor came by , and expressed a keen interest in my bread, when told that it contains no added yeast and that it is naturally fermented. She picked up 4 loaves for her sister, who suffers a yeast allergy of some sort. The roasted garlic bread sold FAST, as expected, followed by the rye pain au levain, and lastly the flaxseed. I have noticed how chewy and slightly hard my breads were, especially those baked 3 days before the market, which was disappointing. The crumb of the Rye pain au levain would stale faster than I'd like, and so baking all bread in the preceding night will resolve the freshness problem, but that requires a larger capacity oven which I don't own, yet. Freezing needs space too. As to the 80% rye, i had an old rye bread in the freezer and used some of that in the soaker. The news here, is that I've used a cold soaker (non boiled water) instead of the usual scald. I'm pretty pleased with the crumb and overall flavor. I think I like a cold soaker for this type of bread.